I LOVE to organize...almost as much as I love crafts, almost. One day we'll live in a permant home where we can take time making things our own and just how we want them. For now, we move with the needs of the Army....a lot. I think through everything we bring in our home. 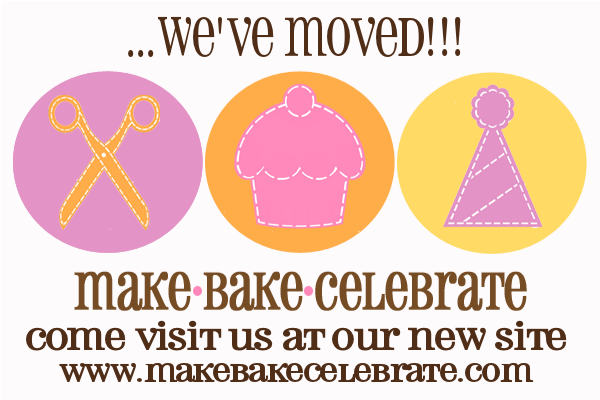 From our furniture to the kid's Christmas gifts to make sure there's a spot and it will be ok when we move again. So I'm a little OCD. I don't have a say of where we live or where my husband will be or how long really..but I can keep our own house running smoothly. 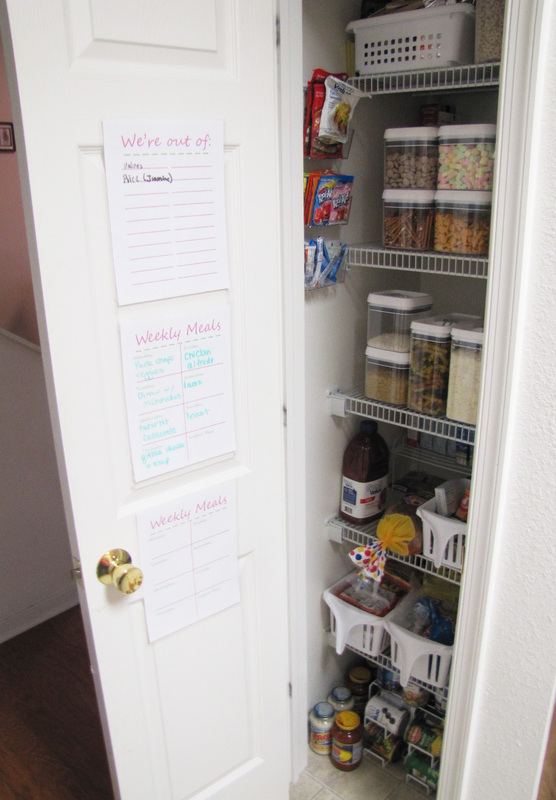 Back to the pantry - our pantry here is this little skinny closet with shelves. This pantry has always been a pain...we have to cram things in there, I forget to buy this, I bought way too much of this because we already had 3 in the back, the cans never stayed in order, the snacks in the back we forgotten about it and went stale, the hubby complained we never had quick foods, and when hurricane Irene came I realized wow...we do not have a little stock of food incase of an emergency. Sitting things just on the shelf there was barely enough room to stock up on what we needed for the next two weeks. So I decided something had to be done about it. And I'm really loving how it came out! It's not rocket science but it sure has made my life better and my mommy duties much easier. I made these sheets to hang inside the door. I laminated them and velcroed them to the door. 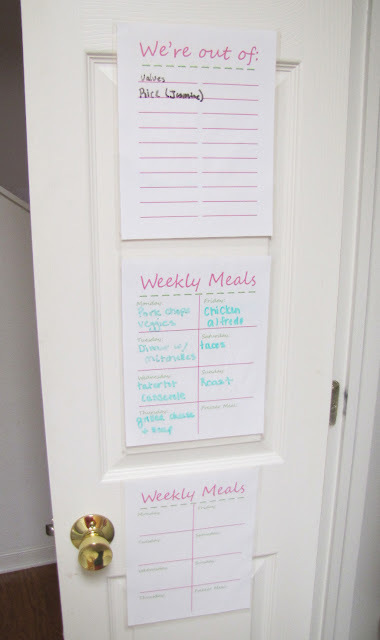 (with the little circle ones) We've been trying to set our meals in advance for awhile but I figure this will help me stick with it. It's right inside the door so even if I am gone the hubby can follow it. On top I made a "We're out of" sheet. This has helped so much! No more forgetting to put items on the grocery list or hubby writing them on the dry erase board to only get erased. I now sit down every two weeks and fill these out along with the grocery list. I also added a freezer meal spot at the bottom. I am trying to get in the routine of making meals in ziplocks to pull out for those crazy nights. We already had these cereal boxes to keep it fresh. 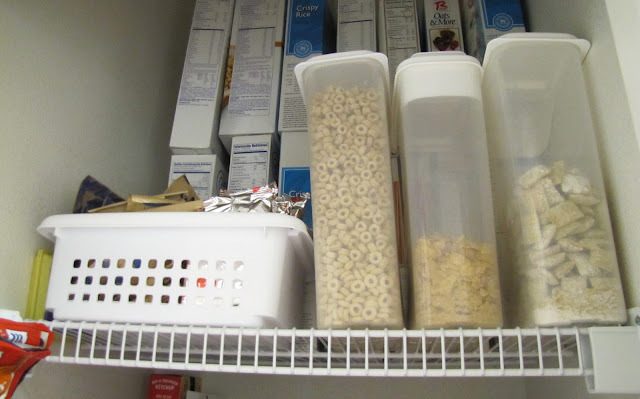 But I added this little basket to store oatmeal and poptarts. My kids think poptarts are a food group. I added three little sink caddy's to the wall for all those annoying little things! These were less then two bucks. I posted this long before I fell in love with the amazing velcro command strips. You can attach them and easily pull them off when needed..and no paint peeling. Love them. These little guys can be pulled of easily to pick from. I used velcro circles to attach these as well so they could be pulled off to pick from. I was a little worried about them taking off the paint but I pulled one off today and it was ok. If your worried about the paint I would prolly skip this. We have to paint anyway when we move so no biggie to me! Here's my favorite part!!! 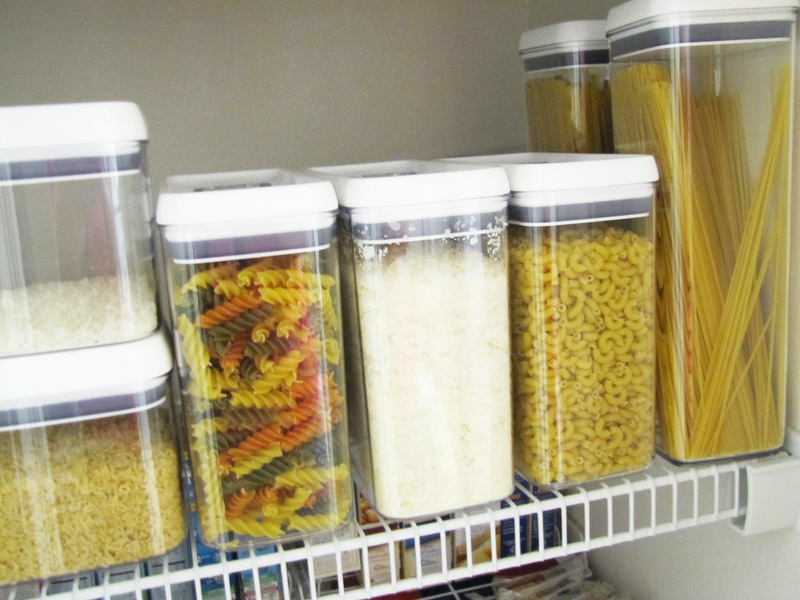 These storage containers are awesome. I've been wanting some of the Target ones f-o-r-e-v-e-r. But they are like 16.99 a piece (yikes). So when I ran across these at Wal-Mart awhile back I was really happy. They were no more then 6.99 a piece depending on size. So although it was kinda pricey to buy a bunch of them all at once it was well worth it. Now everything is lined up and organized and I can see exactly what we are low on or out of. 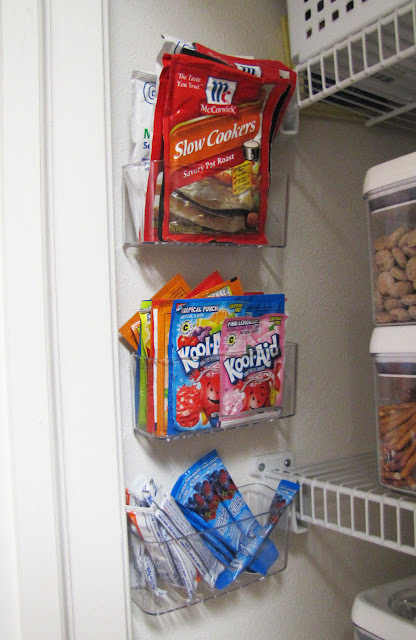 On the top shelf I put containers for snacks. 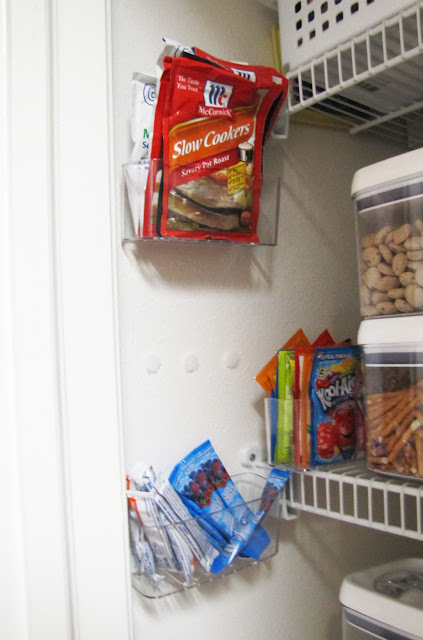 Snacks are a must with 3 little ones and it seems like we never have enough. 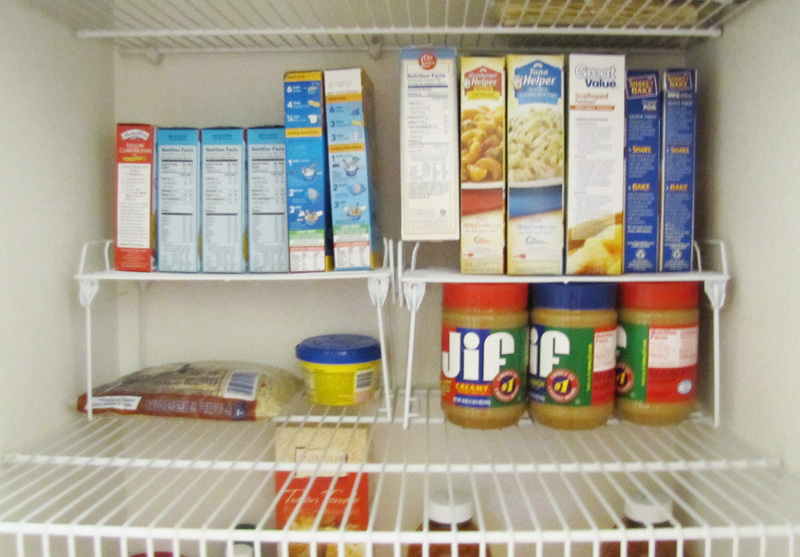 On the bottom shelf I put all the staples we generally keep around..noodles, rice, spagehetti etc. This way when I sit down to make a grocery list it's obvious what staples I need to buy and how many snacks. Additionaly these were considered an investment for us. We can now move our food in these containers instead of throwing away everything opened like we've had to do several times before. 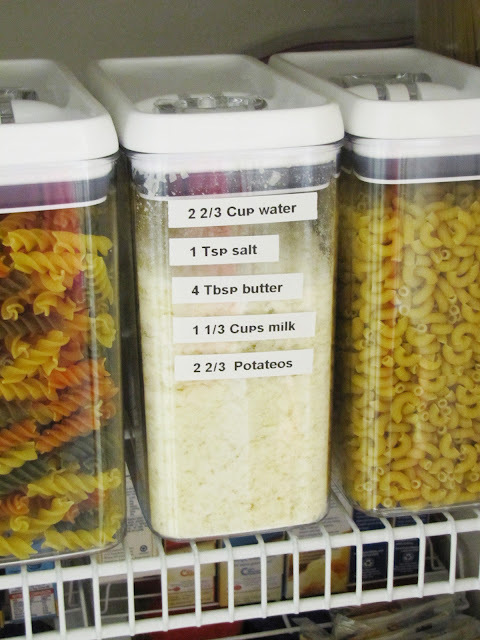 For the potatoes I just used my label maker to note the amounts needed of everything. Another great thing about these. Behind these the shelf is totally empty. 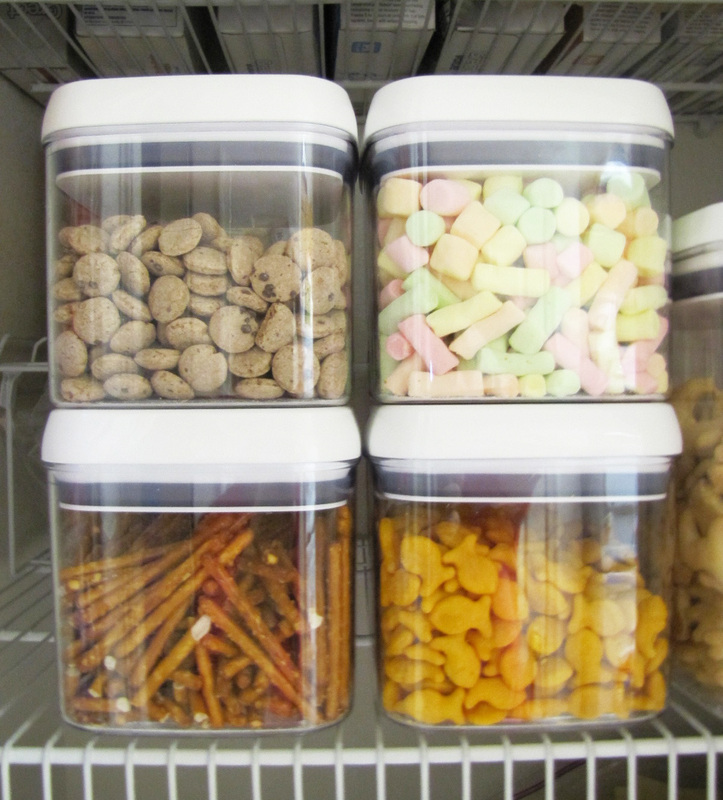 Plenty of room to add things and store extras not yet in a container. I got these baskets for around $2.00 at Wal-Mart. They are great because I can put random things in them and they easily pull out. And I can store things behind them! 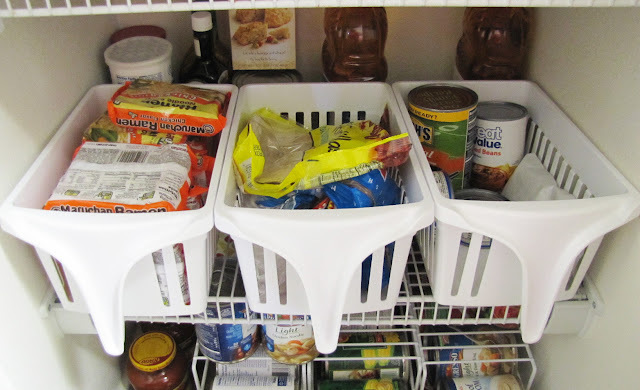 And behind these little baskets I found these little wire shelves at the dollar tree!! They will do the trick and again they double the space. I have always wanted something for the cans. 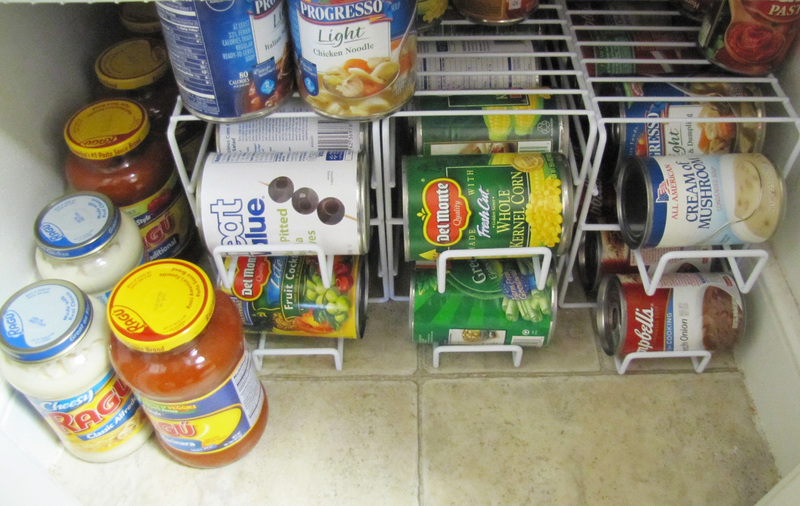 They can be a lot online but I found these for $6.00 at Wal-Mart again..they had a lot of pantry stuff!! 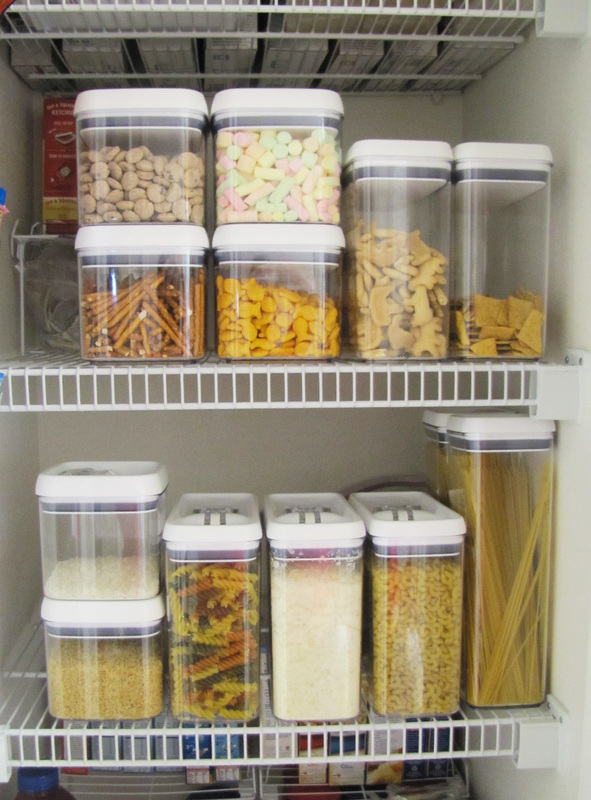 I seriously doubled or if not tripled my pantry space. I feel like I need to buy more food to stock it up! lol. And the hubby is happy there is always quick food on hand. It has finally put grocery buying into a system I don't completely hate! 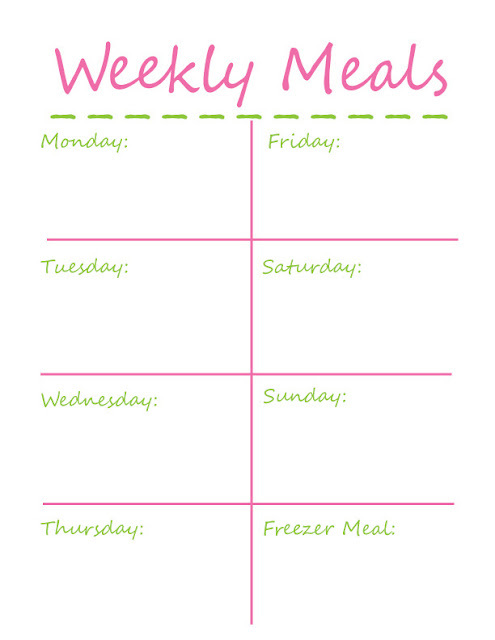 I fill our meal calendar, add our out of's to the list, meats, produce, and then snacks. And they great things is..this stuff will pretty much work where ever we live :) So like I said, it's not rocket science but it's pretty darn helpful if you have a closet like we did! Happy organizing! Little Bo Peep and her sheep! How to - make pumpkin treat bags! How to - make a little bitty bow.